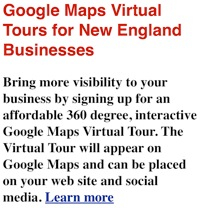 VisitingNewEngland.com Dining Reviews >>> Assonet Inn, Assonet Village, Freetown, Mass. Article by Eric H. Photo by Joan H.
the jukebox turned itself on and played the Tubes rather catchy 1980s hit single "One in a Million." I said to myself, "Yes, this place certainly is," while wondering if this was a paranormal moment or if someone was just using the remote control (or perhaps both). 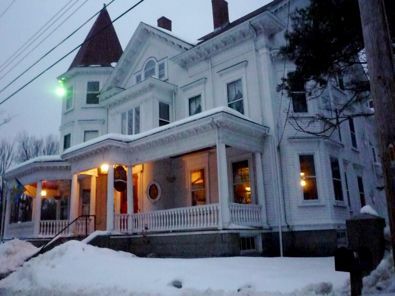 From the outside, the Assonet Inn surely looks like one of those special, old-time New England dining destinations with its stately Queen Anne Victorian style appearance, complete with a large wraparound front porch, tower, bay windows, decorative trim, and balcony. On the inside, the classic Victorian appearance continues with a grand staircase, beautiful moldings, fireplaces, high ceilings, and intricate carved wood paneling. The look of the Assonet Inn also fits in quite well on historic, residential Water St., in the Assonet village section of Freetown (south coastal Massachusetts region). You'll see one after another of well-kept sea captain's homes, Victorians and Colonials that comprise a truly underrated New England destination. What a beautiful street! Around the corner, the presence of tiny white buildings that house the Town Hall and Guilford H. Hathaway Library -- as well as a lovely town green with gazebo, the majestic 1809 North Church and a variety store named Grandpa's -- make for a scene that suggests "the village that time forgot." Bounded by the Assonet River, Assonet Bay, and Assonet Bay Shores makes this cozy, little village even more scenic and seemingly a million miles away from civilization -- quite remarkable, given that busy Route 24 is just a mile down the road. With the stunning sight of the Assonet Inn on a classic American street, the odd thing is, however, that the fancy dishes you'd expect from a place like this are non-existent. Rather, you'll comfort foods on the menu like meat pies, fried clams, bar pizza, hot dogs, fried chicken and spaghetti on the menu. Our waiters (they are brothers that live in the apartments above the restaurant) were dressed in camper shorts and displayed no pretensions whatsoever -- salt-of-the-earth folks that also served as amiable bartenders that night. On a rainy night, we stood in awe of the Assonet Inn and proceeded to enter through the front door on the wraparound porch. The door was locked. We retraced our steps and reentered through the side screen door, which was open. We walked past the warm, comfortable-looking bar with plenty of friendly local conversation, en route to be greeted by the older brother that seated us in a very old-looking but pleasant and welcoming dining room. This room looked like a "needs updating" Victorian home dining room with slightly worn wooden floors, outdated decor, and old wooden booths that reminded us of the old Joppa Grill seats from that famed, but former restaurant in East Bridgewater, Mass. Looking around the restaurant, we saw a nicer looking dining room -- spacious, more updated and really what we expected of a Victorian dining room before arriving. One of the waiters told us that both dining rooms are almost always occupied on a Saturday night, but with the lousy weather during one of the worst New England winters in history, the crowds weren't there -- thus, the nicer dining room was closed for the night. Walking past the lighted, neon "specials" board (with changing colors! ), we saw the beautiful staircase and a foyer that reminded us of the grand style of this type of architecture. Funny thing is, however, that with the empty, almost eerie feeling of the place -- juxtaposed with its innate grandeur -- brought upon mixed feelings. We didn't know if a Newport-type socialite would be coming down the magnificent staircase in a ball gown or Grandpa Munster would be arising from the unfinished basement. Ultimately, we began to enjoy the Assonet Inn. The baked stuffed chicken (with good sides of squash and green beans) with Thanksgiving-style stuffing, tender fish and chips, chock-full-of-clams chowder and perfectly-formed grilled cheese sandwich were all mighty tasty. With two orders of the chicken and ditto in quantity for the very good "Death by Chocolate" brownie with ice cream, two cups of coffee and three hot chocolates, our total meal cost came to just over $44.00 (cash only here, folks). That's less than a fill-up of gas for many of us! We expressed our gratitude more than a few times to one of the waiters, and he said each time, "That's what we like to hear." He answered with sincerity, a smile and reciprocal gratitude that we liked dining at the Assonet. As we headed off into the inclement night, I felt an immediate connection to the Assonet Inn -- and the village of Assonet. When we first arrived, our first impression was that this might be a first and last visit. On a wiser and more balanced second thought, however, we'd love to return again. Not for a fancy meal or overall dining experience, mind you -- just for a "real" dining destination with good, down-home cooking served by nice folks in a very pleasant community. Those "One in a Million" places will get you every time, indeed!